World number one Michael van Gerwen demolished Daryl Gurney 7-2 in his last Premier League match to make it three wins from four matches played in the 2018 Premier League. In his opening four matches he has faced the players ranked 2nd, 3rd, 4th and 5th in the PDC Order of Merit. Although he is second in the league, Van Gerwen tops most of the 2018 Premier League stats tables, including tournament average and tournament checkout percentage. Added to that, he also has the highest first nine dart average. At the UK Open last weekend, Van Gerwen suffered a rare early exit in a TV tournament when he lost 10-8 to Jeffrey de Zwaan in the last 64. His match average of 96.47 ended a run of 27 consecutive TV matches where he had averaged over 100. Simon Whitlock suffered a first defeat of the Premier League season in his last match two weeks ago when he went down 7-3 defeat to Michael Smith. Whitlock had broken the Smith throw in the opening leg but then went on to lose the next four legs without having a dart at a double. He managed to get back within one leg of Smith at 4-3 down but then missed chances were to prove pivotal as Smith won three consecutive legs to seal the victory. His performance against Smith was without doubt his poorest so far in the 2018 Premier League; his match average was a lowly 85.6% and his checkout percentage was 21.4%. Despite that defeat, he still sits in third place in the table, though he does have matches against Van Gerwen (this week), Anderson and Wright to come during his next four fixtures. Whitlock lost 10-7 to Ian White in the last 64 at the UK Open last weekend; his match average in that defeat was 89.60. World number one Michael van Gerwen may feel he has a point to prove following his shock early exit to Jeffrey de Zwaan at the UK Open last weekend. Although it wasn’t a poor performance by most player's standards, he did play below his usual level and his opponent took his chances superbly. Whitlock produced his worst performance of the 2018 Premier League last time out against Michael Smith; he has six points on the board so doesn’t really need to panic on the back of that one result but he will be well aware he has a tough run of fixtures coming up. 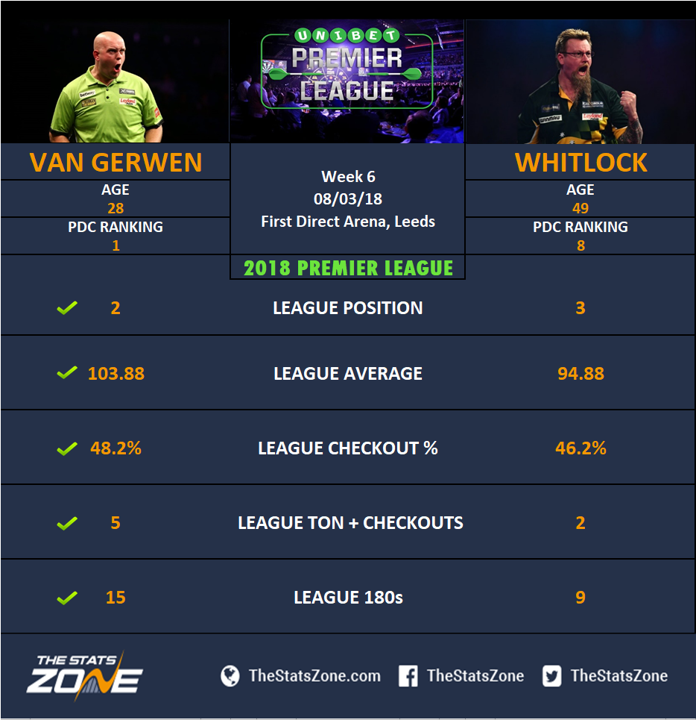 Van Gerwen has been very dominant against Whitlock over the last few years, winning 19 of the last 20 matches they have played and it is very unlikely that he will suffer an upset against the Aussie in this encounter. Expect a well-motivated Van Gerwen to take the two points.